SpreadSheet consists of two main parts: a toolbar with instruments panel and a stylized datatable. 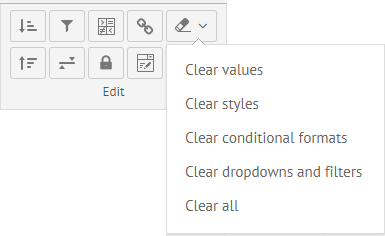 The toolbar contains a panel with instruments for editing and formatting the content of table's cells. There are two modes of displaying a toolbar: the "default" short one and the "full" one. In the default mode, toolbar is shown with a limited set of buttons. To refer to the toolbar object, first you need to specify the id of a toolbar in the toolbar configuration. Then you can address the toolbar via its id. This section provides a detailed description of each block of buttons, their names and their purposes. Besides, it includes a pair of buttons "increase-decimals" and "decrease-decimals" which allow increase/decrease the number of decimal places. Settings for the default toolbar are specified in the buttons configuration object. It contains the names of button blocks as parameters. The parameters' values are arrays of buttons that are included into this or that block. The button blocks' names correspond to the properties defined in the localization files that specify the language of its labels. The default toolbar specified through the buttons configuration object has just one level. If you want to create a two-level toolbar with more buttons or to customize the "full" toolbar with the full set of buttons, you should follow the instructions described in the Customizing the "toolbar" collection section of the User Interface Guidelines chapter. In case you want to remove some block or button specified in the default configuration, you need just not to define them in the buttons object. To add your own block of buttons into the toolbar, you should specify its name as a property in the "buttons" configuration. The value of this property is an array of buttons. To add a custom button, you should specify its name in the array of buttons of the corresponding block. If you don't want to show the block's name, add the "$" sign before the block's name. 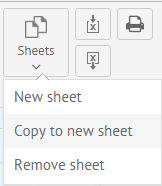 view: "label", width: 150, label: "My SpreadSheet"
The datatable part of SpreadSheet features the same functionality that the Datatable widget does. So, you can customize the datatable in SpreadSheet in various ways. For example, you can attach a context menu with some actions for datatable cells and call the handler function on the right click.